"If you seek my monument, look around you." 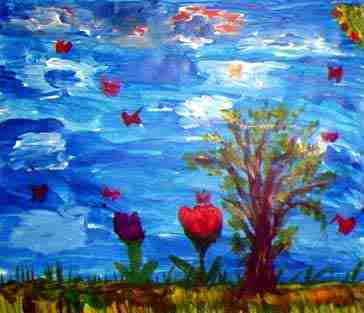 A vibrant, beautiful tree benefits everyone... now and for future generations to come. 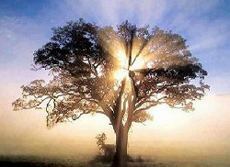 For this reason, a tree provides a wonderful symbol of the continuance of life while benefiting the earth. Install a bronze plaque with his or her name on it to keep their memory alive for all who see it. Pay tribute to a loved one while being environmentally conscious. 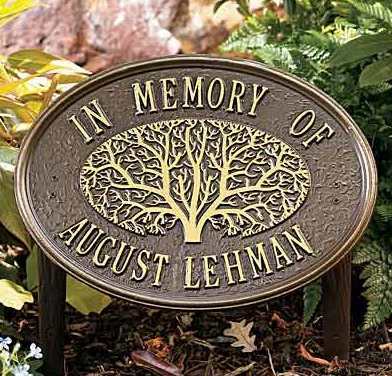 Memorial plaque is crafted in Michigan of weather-sturdy cast aluminum with high-contrast bronze/gold finishes. Two 12" stakes incl. We present below a collection of attractive tree planting kits that are appropriate for sympathy gifts, as well as useful for a family to create a living memorial to their lost loved one. 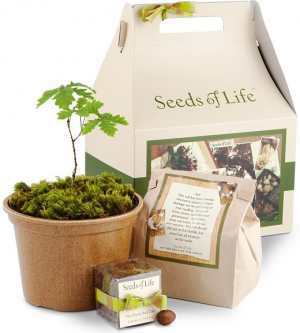 These tree kits provide the materials necessary to start your own memorial tree from seed. This would make a great project to involve bereaved children, from the starting of seed to the planting of the new tree in a garden ceremony that they help plan. Thought to have been extinct for centuries, this rare species of redwood is making a big comeback in the gardening world. Beloved for their attractive lacy foliage and ability to grow quickly in most settings, the Dawn Redwood is a magnificent piece of history and this complete growing kit makes a lovely commemorative or special occasion gift. Eco-Friendly Pot & Saucer, preconditioned oak tree seed, soil, moss and instructions. 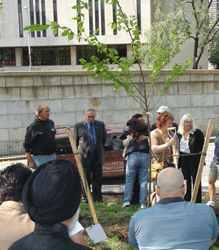 If you would like to use your new memorial tree as a focal point for a whole new memorial garden in your yard, visit our PLAN A MEMORIAL GARDEN page.